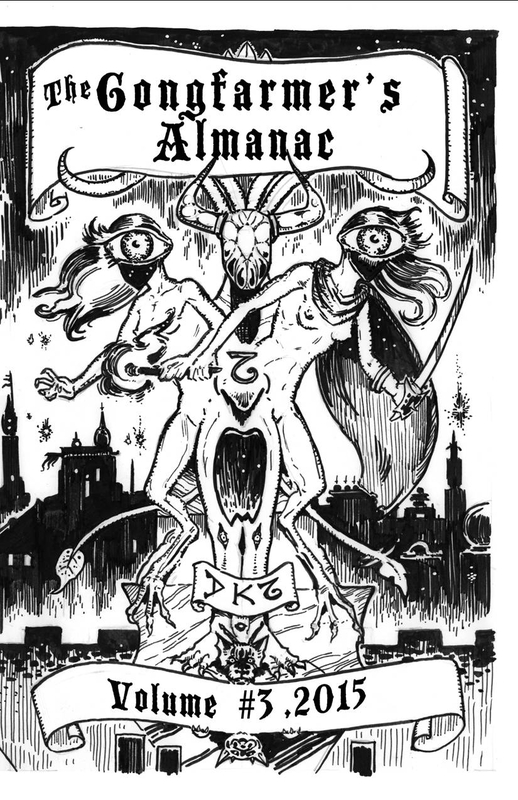 The Gongfarmer’s Almanac: Volume 3: Adventures is a Dungeon Crawl Classics RPG Zine written, illustrated, and produced by the DCC RPG G+ community under the creative vision and direction of Doug Kovacs, Harley Stroh, Doyle Wayne Ramos-Tavener, and Jon Hershberger. This volume was written by Daniel J. Bishop, Clint Bohaty, Jon Hook, Peter Mullen, and Noah Stevens. Illustrations are by Marc Radle, Daniel J. Bishop, Jack Kotz, Doug Kovacs, Nick Kuntz, William McAusland, Peter Mullen, Kyle Nicholas, Jason Rasgorshek, Noah Stevens, Carla Stroh, and Mario Torres. Disclosure: I am listed as an author, illustrator, and proofreader on this volume. Although listed as "Volume 3 of Five Booklets", there are actually six volumes in the 2015 release of The Gongfarmer's Almanac. Hemlock Bones Mystery Adventure #1: The Coal Snoot: This is a level 1 adventure by Clint Bohaty, which is inspired by the works of Sir Arthur Conan Doyle. The PCs play a combined Inspector Lestrade/Watson to the character of Hemlock Bones, who is largely a vehicle for the judge to nudge players as needed...and to swoop in and take the credit at the end. There are very few good mystery adventures on the market, because mystery adventures are hard to write. What if the PCs miss the clues? What if the players are having a hard time interpreting what those clues mean? How do you avoid turning The author here supplies guidance to the judge to make the adventure work. If you've ever read the original Sherlock Holmes stories, you've probably pondered about Watson's amazing forbearance. More than once, Holmes deserves a hard right cross from the estimable Doctor. (Of course, the literary Holmes is also a formidable bare-knuckle boxer, so it might be all for the best that Watson never becomes embroiled with him in fisticuffs. Be that as it may, Clint Bohaty takes into account the potential "death" and looting of Hemlock Bones, both to allow the judge to move him offstage (and give the PCs the spotlight) and, I suspect, because the author knows one or two players. The Marvelous Myriad Myconid Caverns: Peter Mullen supplies a walk along the subterranean river Yimmer, in the Endless Dungeons of Acererak. Designed for 3rd-4th level characters, this adventure might take a little bit of prep work to run well...not every creature encountered has statistics, and while the water of the Yimmer may have a myriad of effects, it is left to the judge to determine what is happening when the PCs visit it. Nonetheless, I think that this is my favorite piece in the volume...it manages to skirt around the precipice of whimsy without ever falling in! It also comes with a 1st level wizard spell, fungoid fisticuffs. May Flowers: This is a 0-Level funnel which I wrote. The illustration on page 32 was created by my co-worker, Kyle Nicholas...you can just see a leg hanging out of the lower flower. The funnel follows upon the accidental discovery of a buried statue of Flos Tenebrarum, the Flower of Darkness. The adventure was inspired by The Disinterment of Venus by Clark Ashton Smith. Man-eating cowslips are an homage to the Man-Eating Cow from The Tick. Thunder logs are inspired by The Lavalite World by Philip José Farmer. Pit-roses and pierceblossoms are ways to make standard-type traps work with the theme. 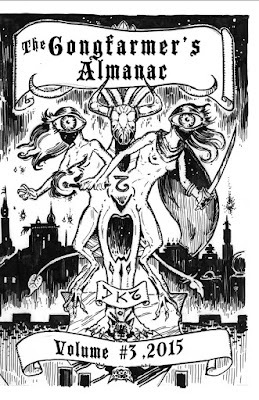 Tomb of the Thrice-Damned War Witch: A relatively short adventure for 4th level PCs by Jon Hook, where players may well wish that they left their characters at the inn. This is a deadly adventure which pulls no punches. The treasure may be worth it if you can reach it. Or it may not. This is the kind of thing that characters take on because they are fools, because they have need of a specific item (and here I am thinking of the wand, Obezaeth), or because they want to prove that they can rise to the challenge. The Worm Cult of Laserskull Mountain: This is a scale-able adventure by Noah Stevens. Well, really it is more of a template to build your own Laserskull Mountain. There is a mash-up of influences here. An obvious one seems to be either He-Man or the Holmes Basic side-view of Stone Mountain (or both) that influenced Jeff Sparks' Skull Mountain. Other influences appear to be The Land of the Lost or maybe just Lost (the shield pylons), H.P. Lovecraft, and Harley Stroh's Purple Planet. I did note the following, and wondered if it related to The Crimson Void: "Being averse to causing the actual deaths of other sentients, the EMBALMERS use strange crimson energies to place attackers in a lightless anti-dimension rather than kill them outright. Hateful succubi and skeleton-demons live within the CRIMSON VOID, and blasts from the VOIDGUN are only unleashed in the direst emergencies." Stealing your killer plants! I needed some vampire bushes and you've done it already. Thanks. You are very welcome! I hope they work for you!